I’m trying to find my way back to posting on my blog again. 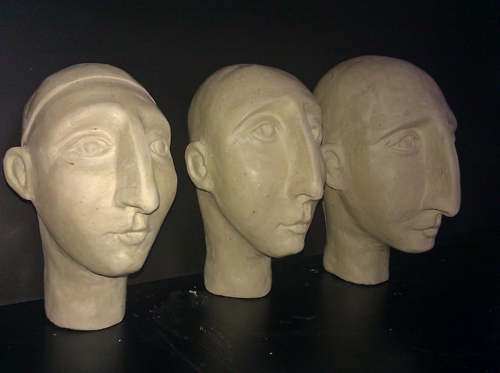 I saw this WordPress Weekly Photo Challenge: Faces, from September 16th and decided to post an image of some new heads I’ve started sculpting. I’m hoping it will help get me back in the habit of posting again. This entry was posted in art, clay, narrative sculpture, Small works and tagged Postaweek2011, Weekly Photo Challenge. Bookmark the permalink. I love these heads- especially the prominent noses! These are very enchanting pieces. I think the faces are sensitive and emotional. Keep up the great work. Thank you so much for taking time to look and you kind remarks. Sorry, I didn’t respond sooner. I’m not keeping up with these posts. Hope to continue to re-focus in the coming months.